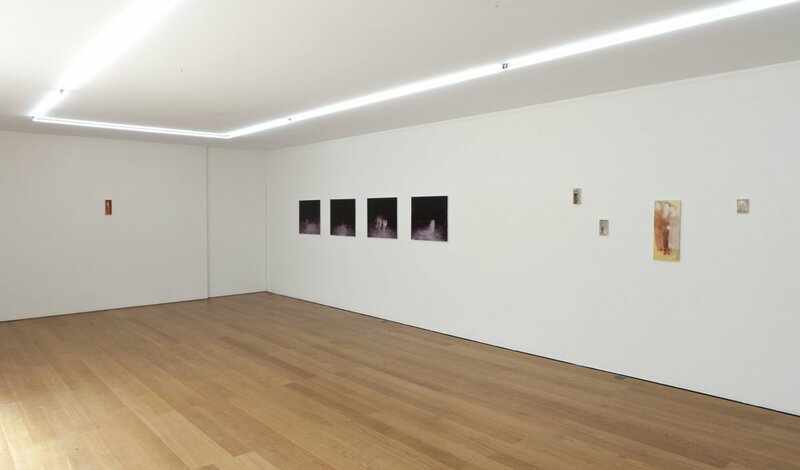 at Galerie Rüdiger Schöttle, 2015. 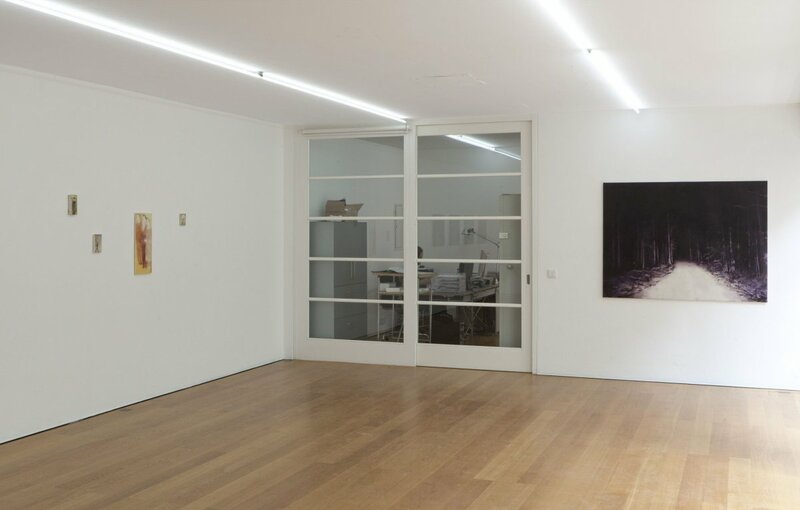 Part One of the Painting Show at Galerie Rüdiger Schöttle exhibits the works of six artists: Helene Appel (DE), Jānis Avotiņš (LT), Adrian Ghenie (RO), Toulu Hassani (IR), Kour Pour (GB), and Florian Süssmayr (DE). The works of Helene Appel, Toulu Hassani, and Kour Pour are illusionistic in their visual language and those of Appel and Hassani are characterized to a great extent by clarity and objectivity, whereas Adrian Ghenie's works display a markedly gestural, expressive tendency. Jānis Avotiņš's figural paintings are distinguished by their diffuse and reduced rendition and those of Florian Süssmayr by their photorealist technique as well as their subjects' transformation in various carrier materials. Jānis Avotiņš, a longtime affiliate of Galerie Rüdiger Schöttle, has honed his distinctive style with his subtle and poetic paintings and restrained chromaticity. His human shapes and faces emerge from diffuse, often obfuscated backdrops, which alienate the figures from space and time, and give them a haunting, somewhat uncanny aura. This effect is reinforced by the high light-and-dark contrasts he frequently uses. Avotiņš covers the tracks of his figures' pasts and identities, and, in doing so, references movements such as constructivism and structuralism. By peeling subjects out of their contexts, Avotiņš reflects on the mechanisms of the systems of cultural symbols, collective symbolisms, or ideologies: As they are not embedded in their surroundings and, consequently, their assignable milieus or functions, the figures are left to their own devices. Born in Latvia, Jānis Avotinš lives in Riga. He received his art education in Riga, Manchester, and Paris. The works of the young artist Toulu Hassani examine the objecthood, materiality, and surface qualities of painting and its accessories. Hassani creates her works employing an intricate mixing technique and with great precision, and thereby lures the viewer into the trap of illusionism. Viewers never know exactly what they are dealing with. At times, one assumes to make out the canvas frame showing through, at others, one believes to be looking at the rough, untreated texture's wear and tear. With her delicate coloring, Hassani always gives her – only seemingly objective – material analysis a personal touch. 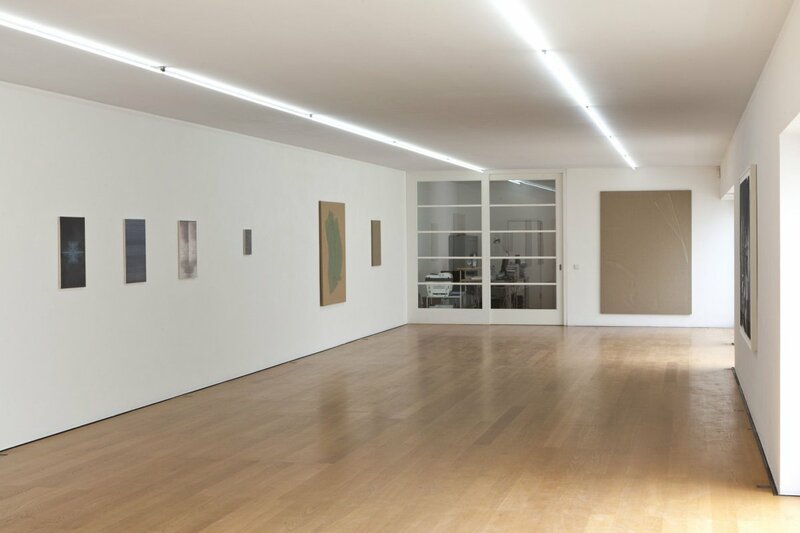 Incidentally, the works therefore also reference movements such as Color Field Painting or they reinterpret Minimalism. Hassani understands the canvas as both her accomplice and adversary, and plays with the patterns and properties she finds in the various materials of a stretched canvas. Toulu Hassani studied in Braunschweig and Valencia and attended the master class of Walter Dahn. She is the winner of the 2013 Preis des Kunstvereins Hannover and, in 2014, received a scholarship for the International Studio & Curatorial Program (ISCP) in New York. Helene Appel is also a master of questioning reality. She paints deceptively real-looking chopped vegetables, grains of rice, thin fishnet threads, dirty puddles, and pencil peels. The artist always sources her subjects from everyday life, from the nondescript, from that which receives little attention. Appel approaches these objects with calm, care, and mindfulness; she demonstrates great reverence by not pretending to deconstruct or outplay their peculiarities and by abstracting her own expressiveness from the work process. The finely painted lines of the nets, the puddles of synthetic resin, and the other subjects always correspond to the sizes of the real objects. With great care and patience, Appel renders her materials and individual parts into groups to form a whole. The repetition and arrangement of the individual parts create dynamic formations and thereby illustrate the power of the collective. Born in Karlsruhe, the artist studied in Hamburg and London, and has exhibited her works all over the world. She lives and works in Berlin. 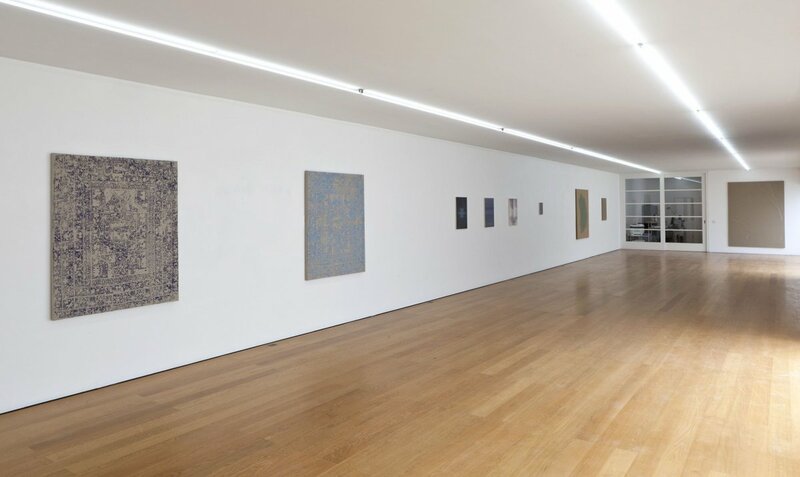 Kour Pour's practice can be categorized as related to Toulu Hassani's and Helene Appel's oeuvre. Like these two painters, the young artist from England with Iranian roots is interested in realistic depictions. 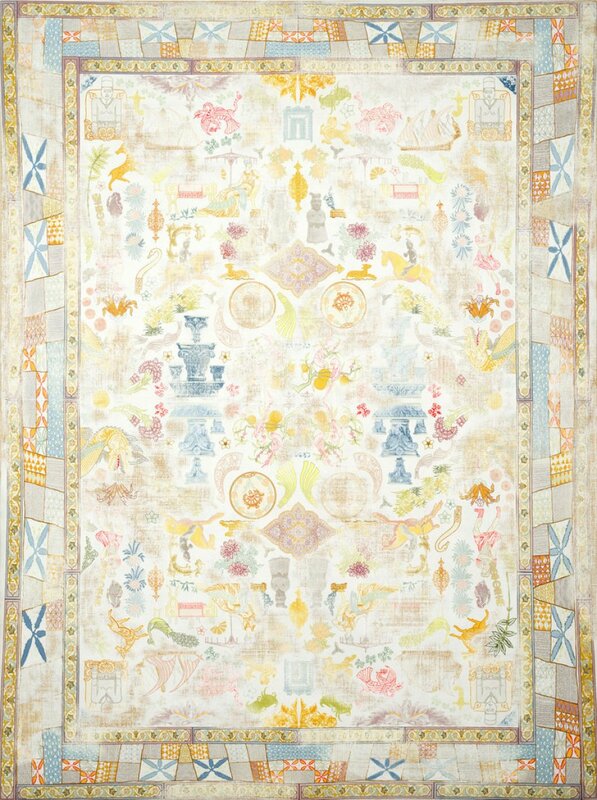 He finds his subjects primarily in the ornamental aesthetic and fantastic repertoire of figures of Ancient Persian carpets. However, Pour is not only interested in reproducing the formal beauty of these pieces of art-historically significant human craftsmanship, but also in concentrating, collaging, and remixing old patterns and circulating these images by means of modern technology. Therefore, illustrations of his works can be found next to antique carpets with corresponding image content in auction catalogues or online. Pour plays with this phenomenon as well as with the increasing conflation and juxtaposition of high culture, subculture, and commercial art. Thus, some of the Old Persian figures and mythical creatures or insignias of power and belief today are used as clipart images for illustrative purposes. Kour Pour lives and works in Los Angeles, where he also attended the Otis College of Art and Design. In contrast to Hassani, Appel, and Pour, Adrian Ghenie's works are usually categorized as gestural paintings. His works range between figural and abstract forms of representation, in that individual figurative image sections are often smudged or superimposed with blotches and spots. Ghenie examines historical figures from the fields of science, art, and politics, and creates settings that tend to evoke a bleak mood. His recurring motifs are interiors furnished with large chairs, sometimes showing his figures seated, pausing, and pondering. In other situations, they stand in a space, gesturing histrionically, covering their face with their hands, or seem to be about to pull their hair out. Time and again, the faces are rendered unrecognizable. Other accessories in these interiors recall the aesthetic of Communist Romania, where Ghenie grew up. Ghenie represents Romania at this year's Venice Biennale. He was born in Baie Mare, studied art at the University of Art and Design Cluj-Napoca (UAD), and lives and works in Cluj and Berlin. Florian Süssmayr's works are a testament to his great artistic skill. His photorealistic paintings are mainly made up of shades of brown, gray, and black, and feature snapshot-like subjects from the punk and rock music scenes, the milieu of Bavarian bars and taverns, or everyday phenomena. By consistently using sepia tones, the subjects seem to date from a more recent past. They carry traces of a "rebel youth," which Florian Süssmayr can look back on just as much as his fellow painters Daniel Richter or Albert Oehlen. 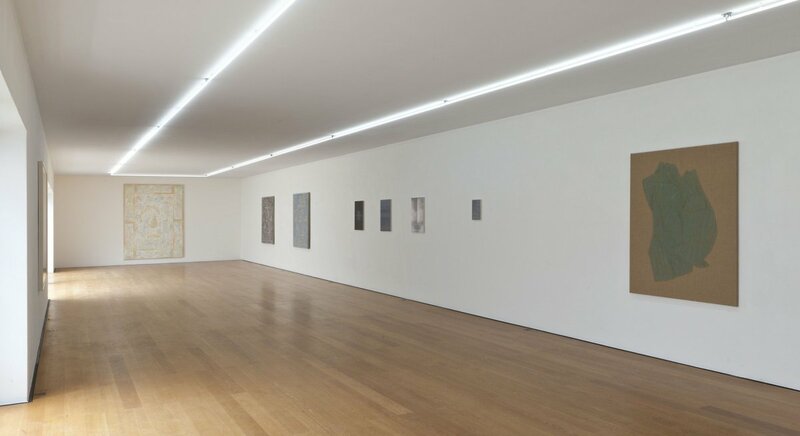 The various subjects and materials undergo a transformation and rearrangement in Süssmayr: A photograph becomes a painting, which is in turn photographed, photocopied, or printed as wallpaper, and thus becomes a background for new images. Another characteristic of Süssmayr's work is his use of text, which appears in the form of logos, album cover titles, and manifesto-like aphorisms. References to the works of fellow artists, well-known locations, motifs, and people can be found everywhere in Süssmayr's comprehensive oeuvre. Florian Süssmayr lives in Munich; he worked as a musician and has been working in the motion picture industry for some time. In Part Two of the Painting Show, which opens September 11, 2015, Galerie Rüdiger Schöttle will exhibit works by Thomas Helbig (DE), Ma Ke (CN), Karin Kneffel (DE), Andrew Palmer (GB), Qiu Ruixiang (CN), and Thomas Zipp (DE).